- 10 % discount until 15 May 2017. Location: The Cliff Beach & Spa Hotel is poised on the cliffs overlooking the Black Sea and the golden sands of Obzor Bay and provides five star quality in design, amenities and services. Accommodation: The Cliff's rooms and suites have all been designed to provide the ultimate in luxurious comfort. Attentively designed interiors of casual elegance offer a welcoming and idyllic retreat. All rooms and suites look over the bay of Obzor, all with private balcony. Most suites have full kitchen, internet access, audio and video equipment and selected suites with open air Jacuzzi. Wine & Dine: The Signature Restaurant-serving international and Bulgarian cuisine at its finest, accompanied by stunning sea views. The Lounge Bar - guests of the hotel can relax and unwind whilst enjoying a favourite cocktail. The Pool Terrace Brasserie and Bar casual, yet sophisticated - serves al fresco dishes and drinks by the pool. The Open Air Lounge - enjoy teas coffees and cocktails through out the day whiles lounging on one of the teak large sofas. The Beach Bar - the place to enjoy a refreshing drink on the beautiful sand of Obzor Bay. 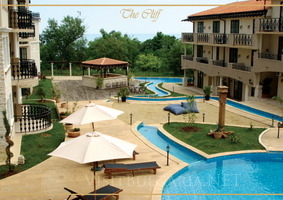 The cliff offers three outdoor pools and Jacuzzi connected with a lazy river as well as heated indoor pool and Jacuzzi. There are several outdoor garden terraces with sea view.